New dad and financial advisor Kevin Matthews wanted to start teaching his baby about money even before his son was born- and almost missed his birth! But the video evidence of his dedication to the future financial health of his baby is a gift that is truly one of a kind. -How he will alter his strategy with his next child! -Exactly what to do if your portfolio is not balanced. Support for Financial Grown Up with Bobbi Rebell and the following message come from TransferWise, the cheaper way to send money internationally. TransferWise takes a machete to the hefty fees that come with sending money abroad. Test it out for free at TransferWise.com/Podcast, or download the app. I would not do it the same way. That was a huge risk that I took, and I got lucky that I was able just to run back up, and everything was okay, and I was in the right spot, so I probably would not do it again. You're listening to Financial Grown Up with me, certified financial planner, Bobby Rebell, author of How to be a Financial Grown Up. You know what? Being a grown up is really hard, especially when it comes to money, but it's okay. We're gonna get there together. I'm gonna bring you one money story from a financial grown up, one lesson, and then my take on how you can make it your own. We got this. Hey, friends. Sometimes we get so wrapped up in getting our financial plans together for the future that we miss something super important in the now. 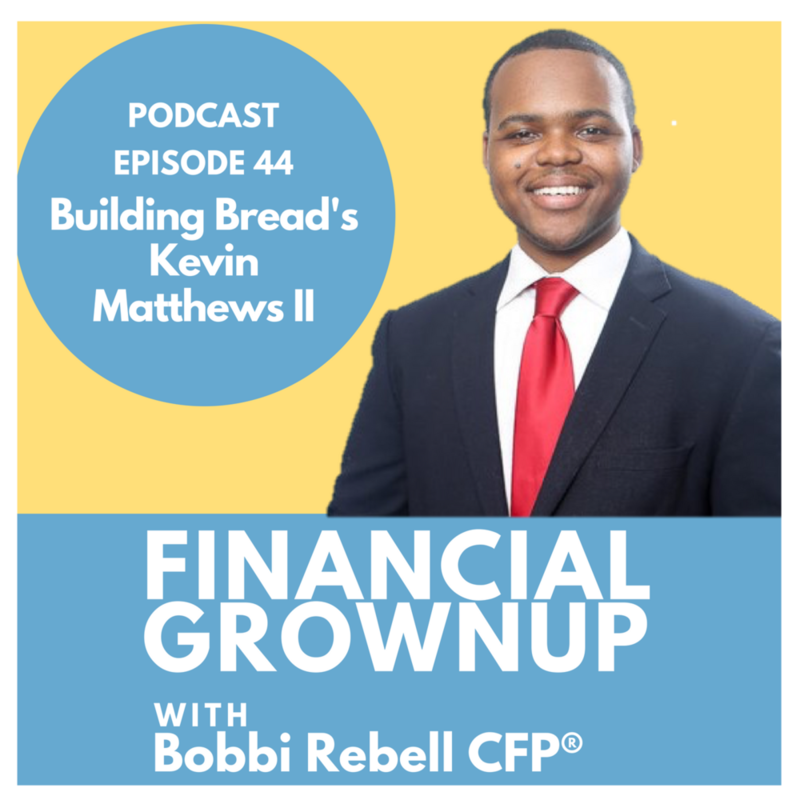 For financial advisor, Kevin Matthews II, who runs BuildingBread and is the author of Starting Point, How to Create Wealth That Lasts, making sure he created a video moments before his son was born seemed really important at the time, but looking back, maybe it could have waited. I'll let Kevin fill you in. Here is Kevin Matthews II. Hey, Kevin Matthews. You are a financial grown up. Welcome to the podcast. We met actually at an event for Phroogal, run by our mutual friend, Jason Vitug. I was so impressed with you, and I went and I ran after you, and said, "I need to rack you down. I need to have you on my podcast." Thank you so much for being here. You gave a great presentation, and that's a lot of what you do. You're a financial advisor, but you also do a lot of speaking. You also have BuildingBread is your website, your company, and you are a two time author. We will talk about more about that. That's a little teaser, my friends. We're gonna talk more about Kevin's books and his business in just a few minutes, but first, I want to get to your story, because it has to do with your baby that was just born, your son. By the way, are you a first time father? Yes. This is then first time. Share our story, because this is very special and very sweet. Yeah. Yeah. I do a segment that airs every week, so I do what's called BreadCrumbs, and I give out financial tidbits every Wednesday morning. Where is this, on YouTube, or where can people see it? This is primarily on Facebook. Yeah. I have it in Facebook for my group. It's also on Twitter and through my email list as well. Every week, I get on. We'll talk about what's in the news. I'll give you a few tips and continue that way. So, at the hospital, about two hours before my son was born ... It was Wednesday. I'm a dedicated person, so I was like, "Look. I need to do this, because once he's born, there's no way I'm gonna stay on schedule." So, I ran downstairs. I shot a video on compounding interest and a few tips we were gonna do for my son to make sure that he was gonna become a millionaire. Right. You called it Three Things for Your Son to Become a Millionaire. Yeah. Three things we were gonna do to make sure my son was a millionaire. So, I went down. I was live in the lobby of the hospital, because I couldn't record in the room. I'm shooting, and I assume at this time my wife has maybe two, three, four hours perhaps before he's born. Oh, no. Kevin, you're a first time father. Babies don't go on your schedule. First lesson. Yeah. I learned. I shoot the video. It takes maybe 15, 20 minutes. I get back in the elevator, and the minute I walk in they say, "Okay. Push." I'm like, "Wait. This is it?" You are so dedicated to your group that you almost missed the birth of your son. Yes. I was so dedicated to his future that I almost missed the present. Yeah. I was able to do both. I definitely made it, but had I been maybe 20 minutes later, going down and recording, or had the video been longer or something, I definitely could have missed it. This was in the middle of that last winter snowstorm as well. Oh my gosh. So, we want everyone to go watch the actual video, but give us some highlights of the advice and the lessons for your newborn son to become a millionaire. Yeah. Yeah. It's really getting yourself in position to make sure that he's gonna be taken care of. There's the life insurance piece, and there's the piece that you want to make sure that you're updating all of your recorders, your beneficiaries, all of that, because sometimes when you have a kid, when you get married, when those life changes happen, you want to make sure that everything is in place to have everything updated, so that it reflects your current family situation, which again, is fluid. The second thing that we just did actually was open up an investment account for him and then begin saving for him now, so that when he's in his 30s, maybe even 40s, he will be much farther along than I was or anyone in my family actually. What kind of account was it? It doesn't sound like you're talking about a 529 for school if he's gonna get it in his 30s or 40s. Correct. Right now, the first account we opened was a custodial account for him. We may do a 529 plan in the near future, but I started with a custodial account. Very good. The full video available on Facebook. What is the lesson from not just the lessons that you're giving your newborn son, but what is the lesson from this story, where you admitted you didn't really plan well, but you also were really dedicated to your business? So, would you do it again the same way? The same way? No. I would not do it the same way. That was a huge risk that I took, and I got lucky that I was able just to run back up, and everything was okay, and I was in the right spot. I probably would not do it again. Definitely planning ahead would have been easier. Probably recording in advance would have been easier as well. All right, but it did have that special live quality as well. It will always have that. It worked for that one time, but to risk it twice may not be wise. So, for baby number two more scheduling. You learn and also the lesson is that babies don't keep to grown up time. Let's talk about your money tip. What should people do? This is great advice for anyone, not just parents. Yeah. Absolutely. Similar to the previous point, but it's being at the right spot at the right time. The way I look at that is making sure that you are properly balanced. Over the last few years, stocks have been great, and that kind of throws people out of whack. What we do is we tend to say, "Hey. Great. I'm just gonna roll with it. I'm making gains," but that's really the time that you want to go back and rebalance your portfolio, and you want to do it periodically. You want to keep those dates static versus checking in when it's a bad day on the market or just randomly when you're in the mood to. Specially, what does it mean to rebalance your portfolio? How does it suddenly get off balance? Yeah. It can get off balance when the market changes. For example, if you're someone who has a 50/50 portfolio, you can't to have 50% in stocks, 50% in bonds, if you're someone who's right in the middle, as stocks grow, your portfolio could be 65 or 70% versus 30% because of the growth of the market. You want to go back. That means that you're taking on more risk, so you may want to go back, look at your portfolio, and bring it back down to where it's 50/50, because that's where you should be based on your goals and your risk tolerance. Well said. All right. Kevin, I want to talk to you about your businesses, because you kind of have a bunch of different things going on, and you're writing books, and you're making videos. Tell us more about what you do. Yeah. At BuildingBread my main goal is to help you set, simplify, and achieve your financial goals. I do that through basic financial education, so I do the videos. I do BreadCrumbs, and I teach courses to make sure that when you're speaking with your financial advisor, when you're trying to figure it out on your own, that you can understand the situation, have a well educated situation, so that you don't feel like people are talking over you or at you. I can speak firsthand. You're a wonderful speaker and presenter, and everyone was mesmerized by what you were saying. I think you got a lot of people to really pay attention to their money and be a lot more deliberate. So, where can people find you and get in touch if they want you to come to their organization or if they want to follow you on social media? Yeah. You can follow me anywhere on social media @BuildingBread. I'm always active there. You can also email me at Info@BuildingBread.com. Awesome. Thank you so much, Kevin Matthews. This has been great. Kevin had a lot of great advice. Financial Grown Up tip number one. We spend a lot of time in the personal finance space talking about planning for the future, but by no means should that divert your attention from the present, when things, like the birth of your child, are about to happen. Perspective. It is a great story to tell your kid, but take note. Kevin would not do it again. Let's try to look up from our phones more. I'm right there with you on that one. We may not even realize all the priceless thing we may be missing, and you can't buy more time. Financial Grown Up tip number two. Just like you schedule a doctor's appointment, let's all take Kevin's advice and do a financial check up based not on when something is happening in the market, for example, but on a calendar driven base, so the decisions are based on what is best for you in a proactive way, not a reactive way, or another good time may be when you have a change in circumstance, like having a baby. I don't really do this these days, but I'm gonna think about Kevin's advice and try to be on a more regular schedule with checking in with family, financial planning, and things like that. I think it's a great thing to incorporate in all of our lives. Thank you, Kevin, and thanks to all of you for supporting Financial Grown Up. I am starting to get a nice amount of applications for our upcoming once a month listener as guest episodes, so keep them coming. We're gonna have some great stories, and I can't wait to hear yours. Just email us at Info@FinancialGrownUp.com. Tell us the money story and the money tip that you would share if you were chosen. Please continue to share this show with your friends and colleagues to help bring more people into the Financial Grown Up community. Rate and review us on iTunes. That really helps us get noticed, and it is truly appreciated. Follow me on Twitter @BobbyRebell, on Instagram @BobbyRebell1, and you can find me on Facebook @BobbyRebell. Kevin truly brought som fatherly wisdom to our program. Great show, Kevin, and thanks for getting us all one step closer to being Financial Grown Ups. Financial Grown Up with Bobby Rebell is edited and produced by Steve Stewart and is a BRK Media production.